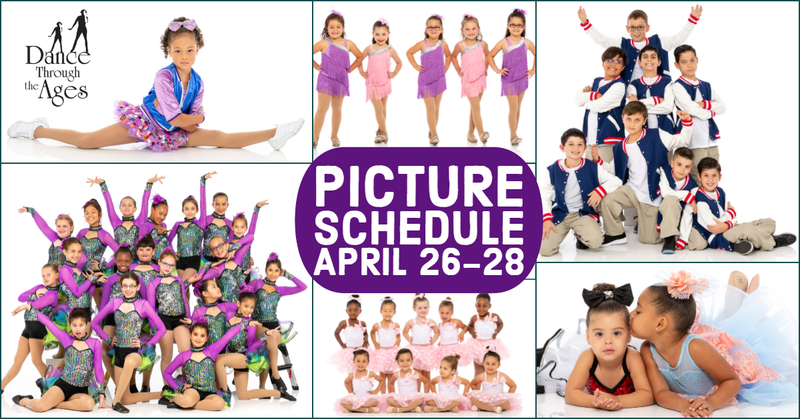 Please find the schedule for Recital Pictures during the weekend of April 26th-April 28th. There are no studio classes on these picture days. Your child’s class day/time are listed next to their song title to make it easy to find their scheduled picture time. Please read the directions carefully so you are well prepared for pictures! If you have not yet received your costume because you were a “late order,” please contact us. Even if you are not having single shots taken, please still plan to bring your dancer for their group shot. Dancers love to see that they were included in the group picture and this is the only opportunity for us to have complete group shots. Remember! Pictures are taken in Studio B. Studio A is reserved for those dancers with costume changes. Makeup is not required, but recommended because of lighting. Makeup must be completed before your child’s scheduled time. We do not apply makeup to any dancers. If you were a “late order” and your child’s costume has not arrived yet, your dancer can still participate in pictures. Please contact us for details. Please turn in your order form as soon as possible so we have an accurate count.